The flooded ruins of a shopping mall in Palu on September 30. Late on Friday, a magnitude 7.5 earthquake struck near Sulawesi, Indonesia, quickly followed by a highly localized, intense, and devastating tsunami. Waves up to 18 feet high inundated Palu Bay, drowning a beach festival, destroying buildings, and claiming over 800 lives. The tsunami caught the region tragically off guard in part due to a failed early warning system. But the mechanics behind what happened were also unusual, undercutting the standard wisdom about how tsunamis are produced. Tsunamis are typically generated by earthquakes that have vertical motion on a submarine fault: A sudden jolt displaces the seafloor, spawning massive waves that propagate across the ocean. But most of the earthquakes around this part of Sulawesi, including the recent magnitude 7.5 quake, are strike-slip ruptures where faults slide sideways with very little vertical motion. So, what could have triggered the tsunami? “Strike-slip earthquakes can generate tsunami by triggering landslides or by displacing seafloor with very steep slopes,” Jean-Paul Ampuero, a seismologist with Géoazur at Université Côte d’Azur in France, told Earther. As Ampuero notes, a submarine landslide or sideways shift of an underwater hillside can sometimes displace enough water quickly enough to trigger the start of a tsunami. Unlike their larger kin spawned when a megathrust earthquake shoves the seafloor up or down, these kinds of tsunamis are unable to cross entire oceans. But the enormous waves can be deadly nearby. In this cause, Palu Bay’s geometry could have amplified the tsunami, akin to how a child scooting in a bathtub can quickly create a wave that splashes onto the floor. The tsunami may have resonated within the narrow space, quickly building into larger waves. Researchers are currently modeling scenarios to explain the disaster, Ampuero said, and were able to simulate the observed tsunami both with a submarine landslide and a horizontal shift in a submarine hillside. Sutopo Purwo Nugroho, spokesperson for Indonesia’s national disaster mitigation agency, supported the landslide theory, citing it during a press conference and tweeting out a video of the simulation. Researchers are turning to viral videos of the tsunami for more clues. (Given the understandable prioritizing of saving lives, the videos are currently unverified.) Hamzah Latief, tsunami modeller at Indonesia’s Bandung Institute of Technology, told Tempo that in a video recorded from a ship in the bay, the water is turbulent and cloudy, indicative of submarine landslides. After spotting what he thinks are the initial ripples of the tsunami filmed from an airplane over the bay, Ampuero said it looked like “waves were produced by the motion of the terrain itself, not necessarily with a landslide,” reinforcing that the tsunami may have been produced entirely by submarine slope motion. 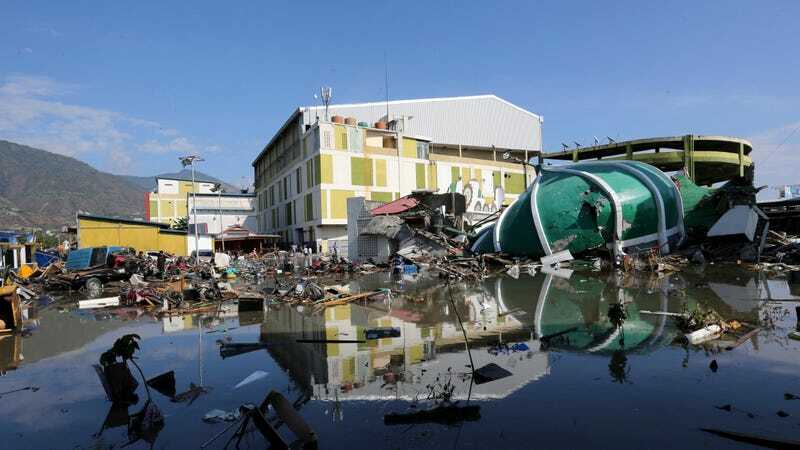 None of the tsunami modellers at Bandung Institute of Technology responded to Earther as of publication, but researchers elsewhere are hoping Latief and the rest of the team will get support to keep investigating once the chaos calms. They’ll need to conduct a bathymetric survey to spot any changes in the bay’s seafloor topography. If they identify any new submarine landslide deposits, the next step will be to model if those landslides were sufficiently large to trigger the tsunami. To predict tsunamis, Indonesia currently relies on seismographs, global positioning stations, and tide gages, with warnings distributed by beach sirens and text messages. Unfortunately, that system didn’t help prevent the recent disaster. A former network of buoys that could have provided more advance warning has been been abandoned after a combination of vandalism and neglect left them inoperable, according to reporting by the Associated Press. And international efforts to upgrade the defunct buoys with seafloor sensors have stalled due to inter-agency bickering. Even if the early warning system had been upgraded, it may not have helped much. With only seven of over 200 electrical substations operating after the earthquake, warning sirens lost power, failing to blare evacuation alerts.